These two recipes will conclude the first series of Movie Night Noms. I like to break up the recipes so they’re not all in one post, but I’m curious if other people like this format. Comment if you have an opinion about it – otherwise I’ll assume this is fine. 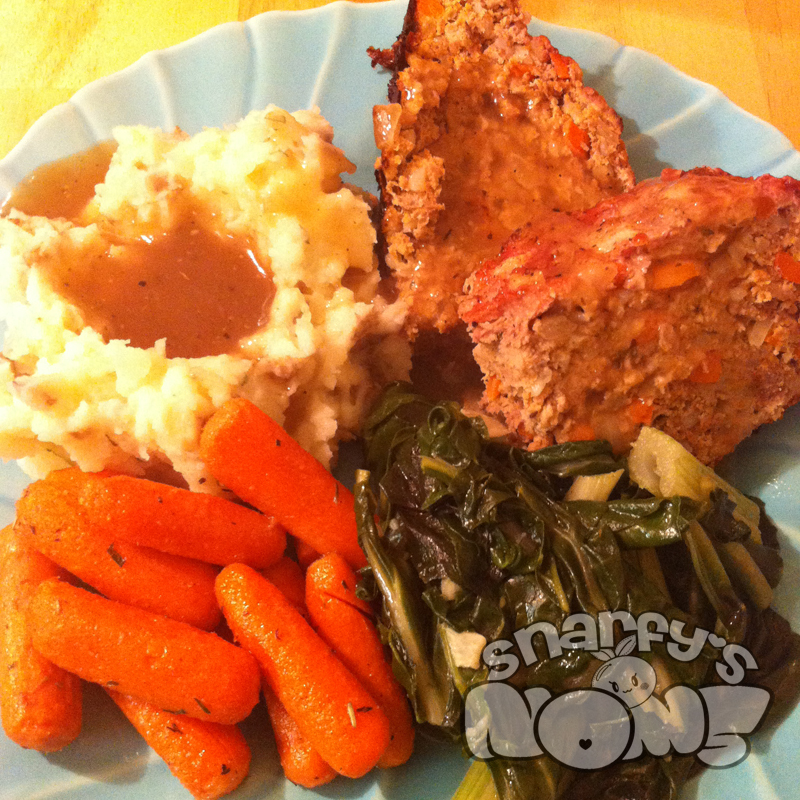 Roasted carrots are stupid easy and can go in the oven alongside your meatloaf. Perfect because it’s two birds with one stone, right? Not to mention that they’re super delicious. Swiss chard is my default leafy green for sides. I feel like it’s easier to deal with than spinach and I don’t get that weird gritty teeth feeling as much after eating chard. However, it is just like spinach in that you need to get a lot more going in that pot than you think you do because it cooks down to practically nothing. Your oven should already be hot because you have a meatloaf in there, remember? Otherwise, pre-heat that bad boy to a high temp (425-450 deg f). 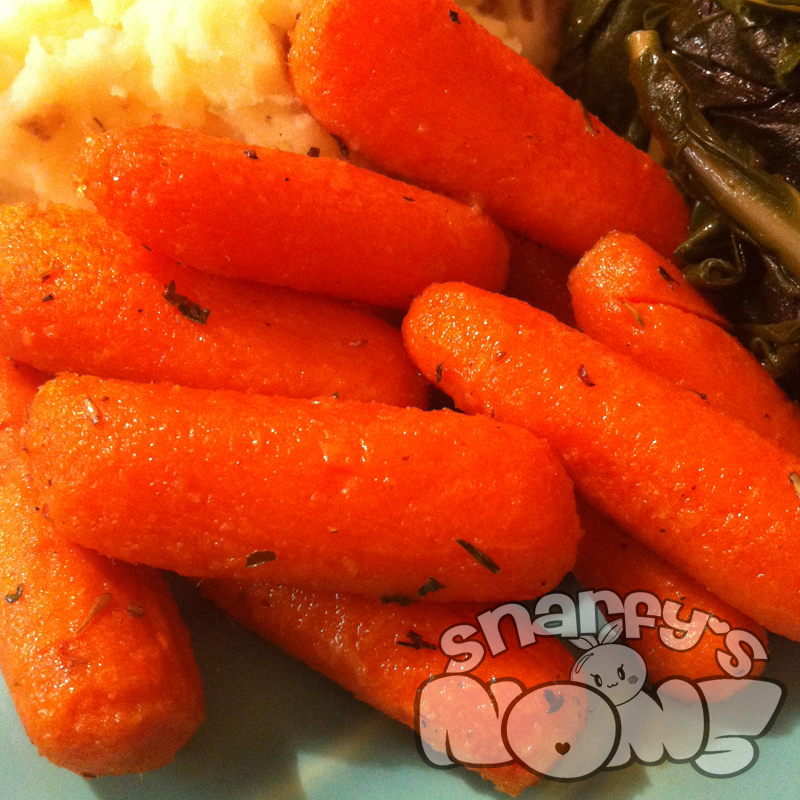 Dump that bag of baby carrots into a rimmed baking sheet while you melt some butter down in a saucepan. Put that thyme and rosemary in there (you could also include a little garlic) to infuse the flavors in the butter. You don’t have to do this long, so when you’re ready, pour that herby melted butter over those carrots and make sure everyone is coated. Rain a little salt and pepper over those carrots and pop them in the oven until they’re tender. Then nom the crap out of them. Prep your Swiss chard by washing it like you would wash some spinach. If you’ve never done this before, the easiest way to do it is fill your sink or a large bowl with cool water. Put the leaves in there and let the gritty dirt settle out. Nobody likes dirt in their food. If the ribs are super thick and tough, strip them out. I like cooking the ribs down and eating them though, so to each their own. Cut the leaves into strips or tear into smaller pieces. Add some oil to a pan and get that garlic in there. Once the garlic is fragrant, add the Swiss chard and a little water to create some steam. Cover that pan up and let the greens wilt. Serve it up!